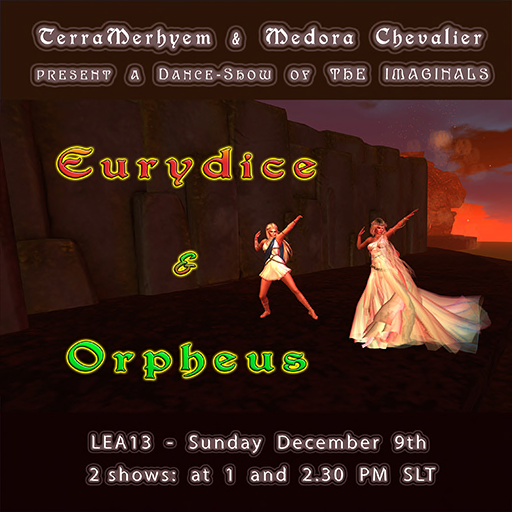 Linden Endowment for the Arts: LEA13 ORPHEUS & EURYDICE "DANCE PRODUCTION FEATURING RAGE DARKSTONE &TERRAMERHYEM WITH IMAGINALS"
LEA13 ORPHEUS & EURYDICE "DANCE PRODUCTION FEATURING RAGE DARKSTONE &TERRAMERHYEM WITH IMAGINALS"
Medora Chevalier and the dancers of Imagines! Wonderful music and background design by Zimp Rexie! (To avoid the lag, we must limit the number of the audience.